Welcome to IBM Ring #129! January 26 was an eventful evening for our Ring, as we held our annual contest for stage magician of the year—the Enslow award—at a new venue: The Musical Theater Heritage Stage 2 at Crown Center—a real theater with comfortable tiered seating. Since we will be submitting a separate write-up and photo-spread of the event, I will simply mention the winners here: Dennis Burks, first place; Gene Kean, first runner-up; Justin Scott, second runner-up. As they have for the past several years, Duane and Janie Fields were the principal organizers of the event, which included an appetizer bar prior to the contest. Our special guest performer and honoree, Michael Finney, also gave a lecture the next day. His focus was not on teaching tricks or theory but rather on providing practical tips on performance, including a critique of some of the acts from the contest. President David Sandy opened the first meeting of his current term on February 6 by thanking Steve Steiner for his ongoing work as editor of our monthly newsletter. He also presented the certificates and trophy to the top three participants in the recent Enslow award competition. Ring historian Dennis Burks read the high-lights of our Ring reports of five and ten years ago. David Sandy demonstrated some items from his magic antiques collection (they still work). Tom Burgoon entertained us with some tales about a device he produced to allow for playing some morbid practical jokes and told some hilarious tales about mishaps with an in-visible-thread reel, concluding with an original poem about practicing magic. We then moved on to the share the magic segment. Dennis Burks showed us some rare books he had obtained containing facsimiles of magic posters of the past. Lance Rich followed with a comedy routine in which he had John Hicks act as a mentalist by reading cue cards that Lance supplied. He also showed us some of his own memorabilia pertaining to The Great Leon, a famous magician of the past. Phil King had a spectator cut a deck of cards behind his back and showed that he had predicted where the cards would be cut. David David (no, that‘s not a misprint) performed a ring-on-rope routine with a lot of mystifying moves. Stu Lewis performed Rick Lax‘s ―”Where it Has to Be” with jumbo cards, and then demonstrated a magic square using a spectator‘s birthday—discussing how it could be used for self-promotion. 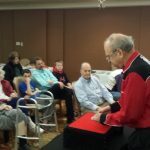 John Hicks performed a few card routines (what else? ), including a Chicago Opener and the revelation of a signed card that had been placed under the card case before the card was signed. Rob Novak performed a puzzling card routine in which he guessed which cards two spectators had selected just from knowing which of five columns each one‘s cards were in. Lots of good stuff coming up. Watch this page. « The Card Corner Finale………..